So sorry about posting so much but there is a lot of really important stuff going on. It seems as though the planet is spinning out of control. Or does it just seem like that when you’re a senior & you’re seeing “two, three, many Vietnams” when what you long to see is “two, three, many Arab Springs”? The Sudanese Arab Spring has barely just begun & already the “regime change operation” crowd is out in force blaming Israel & the US for the popular uprising against a dictator of 30 years. In fact, Israel & the US have been covertly involved in the region for several years which led to the secession of South Sudan from Sudan in 2011, consequent mass starvation & civil war in South Sudan, & a massive refugee crisis. When the ‘regime change operation’ crowd talks about Israel, it is from a dark place of anti-Semitism which obfuscates Israel’s very real role in international counterrevolution. This is a post I wrote in December 2012 about Israel’s role in South Sudan. It plays an extensive role there & has for several years & it’s important to understand how they are involved. But what’s developing in Sudan now is a popular uprising against a deeply entrenched dictatorship that is not manipulated by Mossad or CIA agents trying to pull off a regime change. If they wanted a regime change, they could do what they’ll done in so many other countries & simply assassinate al-Bashir. Over the years, I’ve written other posts about Sudan & South Sudan, most of them revolving around the role of CIA operative John Prendergast & his celebrity sidekick George Clooney. Here handcuffed African immigrants wait in a bus after their arrest by immigration agents in Tel Aviv (Dec. 22nd). Israel is deporting thousands of Africans & preparing tent cities to detain them until deportation. The crackdown is on 50,000 undocumented African immigrants, who they call “infiltrators,” primarily from Eritrea & Sudan, with lesser numbers from other Sub Saharan countries. In 2011, under the Zionist Law of Return, Israel admitted nearly 17,000 new immigrants as citizens from Russia, Ukraine, US, France, & Ethiopia. Many Ethiopians, called Beta Israel, can gain Israeli citizenship because they are lost tribe claimants from the tribe of Dan–even though they were unable to pass repeated DNA tests looking for the distinctive Jewish Y-chromosome. These are the sarcasms that make up Zionist immigration policy. One of the more repugnant features of Israel’s crackdown on the 7,000 Sudanese immigrants is that Israeli machinations & meddling in Sudan since 1950 were part of David Ben-Gurion’s “periphery strategy,” which involved supporting non-Arab regimes in Sub Saharan Africa as a security fence. Israeli policy incited conflicts between north & south Sudan & made them more acute by selling armaments to separatists in the south. This led to intermittent civil war going back to 1955 & despite a peace agreement in 2005 continues to today. Well over 3 million people have been killed & 5 million displaced & forced to migrate. When South Sudan became independent from Sudan on July 9, 2011, Israel was Johnny-on-the-spot, recognizing South Sudan not even 24-hours later. By July 28th, Israel announced it had established full diplomatic ties & signed the first commercial agreement regarding desalination, irrigation, water transport & purification. Curiously, the agreement was not signed by officials in Israel’s Energy & Water Ministry but by Israel Military Industries Ltd, a weapon manufacturer specializing in producing land, air, & naval combat systems. Israeli companies descended on South Sudan like vultures, promising to develop its nonexistent infrastructure, including roads, airports, power plants, agriculture, etc. The US, European countries, & the World Bank promised big bucks to the corrupt regime–but of course it is to develop the neoliberal agribusiness model, exploit the immense oil & mineral reserves of the country, & build sweatshops. As Meir Greiver, an Israeli business tycoon said, “Because the salaries are so very low, I think that many Israeli businessmen who send their manufacturing & textile work to China could do it there instead.” That’s what Israel & the new South Sudanese regime call economic cooperation–deals worth billions of dollars to Israel & foreign investors–but squat to the people of South Sudan! Due the protracted civil war in Sudan, there has long been famine in South Sudan but all these predatory nation builders can provide is armaments & promises. They can move their heavy artillery about the country but when it comes to delivering food, they claim impassable roads make it impossible. That’s what Israel is shipping thousands of immigrants back to! Or do they just need sweatshop labor!? After Israeli recognition of South Sudan, Interior Minister Eli Yishai, who has said African asylum seekers “threaten the Zionist dream,” called for immediate negotiations with South Sudan to return undocumented Sudanese refugees & migrant workers, arguing they no longer needed protection since South Sudan had gained independence. They would be given US$1,300 & a plane ticket home or be forcibly deported. That included 18 South Sudanese students matriculated in Israeli colleges who were not allowed to complete their studies. Some of the very Israeli politicians (like Danny Danon from Likud) who promoted Israeli business ventures in South Sudan are now flapping their gums at racist rallies & inciting Israelis to violence against African immigrants. The Nubian Queen: the crowd is chanting ‘thawra’ (which means revolution in Arabic) to her prompts. Long live the Sudanese Arab Spring. On Monday, the IMF approved a $4.2 billion loan for Ecuador. On Thursday, the Ecuadorian Embassy handed Assange over to British authorities at the request of the US State Department. Coincidence? Or is all about the Benjamins? 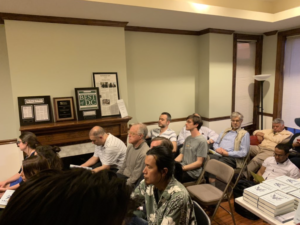 ‘War on terror’ ideologue & Assad fanboy Max Blumenthal tweeted a report that there was standing room only at the launching of his new Verso book. He might have been wiser not to tweet a picture of the event showing ten people, including a man sleeping in the back row. Our man better get used to small audiences since events in Sudan are exposing him & the whole stable of dictator apologists as the political lowlifes they are. Eva Bartlett & Vanessa Beeley better hotfoot it back to Damascus to get programmed for damage control. Things are looking bad for propagandists but very good for the truth. Whoever it was at Verso that authorized the publishing of this book should be fired. Although it also publishes books promoting prostitution as another way to earn a living. Pardon me for jubilation, but how will the Assad regime & it’s apologists ever recover from the Sudanese Arab Spring? The Syrian people have paid such an incalculable price in human suffering because of betrayal by the corrupted antiwar movement & being vilified as terrorists. 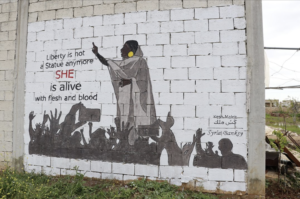 Now the Syrian Arab Spring is vindicated by Sudanese solidarity. No matter what Assad propagandists & their Islamophobic & anti-Semitic guppies say, the whole world now knows where justice & freedom lies. It’s a mortal blow to ‘war on terror’ ideology portraying the glorious Arab Spring as “Islamist” & terrorism. It is not too late for those taken in by Assadism to admit their misjudgment & correct course. We would welcome you back, not rub your nose in it. A young schoolboy killed by Indian occupying forces on Election Day. Is that how Modi campaigns in Kashmir? 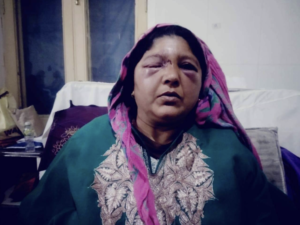 If the BJP wants misguided Kashmiris to vote Modi back into power, it might be the judicious part of brutal occupation to stop shooting protesters with pellet guns—at least till the ballots are cast. Syrian Arab Spring graffiti in solidarity with the Sudanese Arab Spring. Long live the glorious Arab Spring.